Location: Datang Suzhou Thermal Power Co., Ltd.
A has a negative DC insulation to the earth 100K. 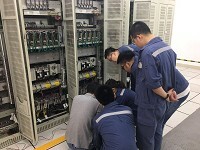 Drop fault power plant step-up station, one by one to test all the branch through our company DC system fault locating device, and finally determine the A segment and B segment DC DC loop net fault, locate the fault by using the fault location device, accurate positioning to the ring the fault point at both ends of the bus. To solve the ring network fault, power plant personnel 30K anode grounding simulation experiment in the outdoor terminal box, use our ground search ground search instrument, to start the search from the feeder screen according to the method of grounding for the analyzer can accurately detect system of anode ground fault, earth resistance is 30.1K, negative normal fault location, fault location device, the fast and accurate location of the fault point location simulation.